How is it that I’ve been writing this blog for nine years, with not a single recipe for broccoli salad in sight? Since Easter brunch and summertime potluck season are just around the corner and, more importantly, because this wrong needs to be righted, I finally got my cruciferous act together. As I have a tendency to do, I took some liberties with the original version by turning this side dish from mayo-dressed to vinaigrette-tossed, switching up the cheese (leave that part out altogether if you prefer a vegan salad) and switched one crunchy element for another. Voilà! My first healthy broccoli salad! 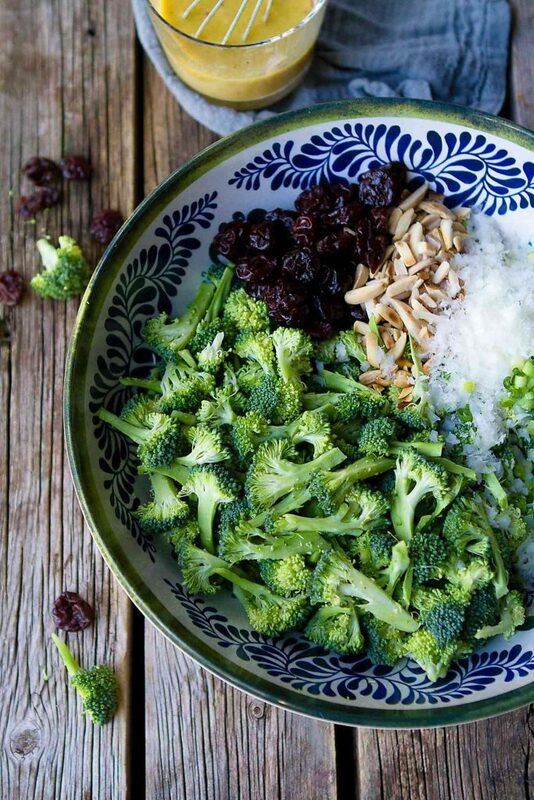 How do you make a mayo-free broccoli salad? 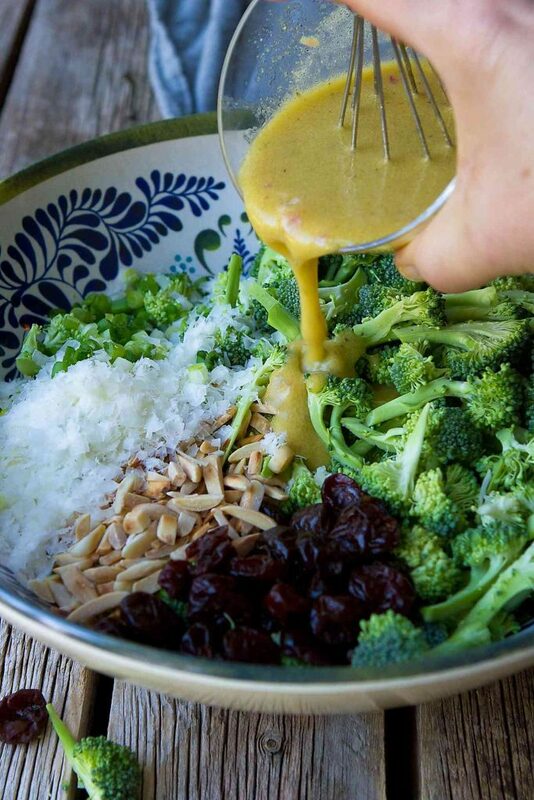 The first step is to change up the broccoli salad dressing from mayonnaise to something a little lighter. 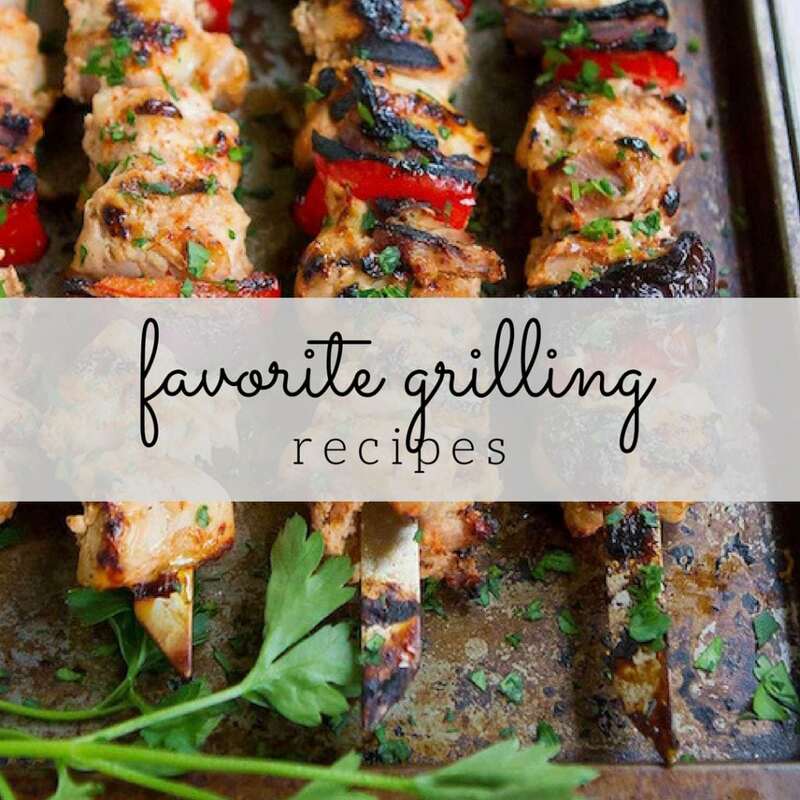 One option is to substitute half of the mayo with an equal amount of plain Greek yogurt. If you’d like to veer away from “creamy” altogether, a simple Dijon vinaigrette is the way to go. Whisk together white wine vinegar, Dijon mustard, minced shallots, a touch of agave nectar, salt and pepper. While whisking, slowly pour in the extra virgin olive oil to form an emulsion. 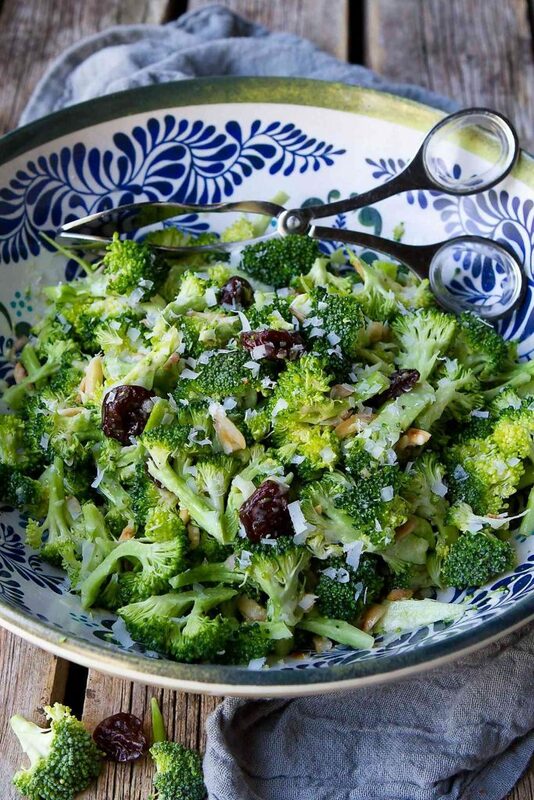 Do you have to cook the broccoli for broccoli salad? You’ll get different answers depending on who you ask. Some people like to blanch the broccoli for 1 to 2 minutes before adding to the salad. Personally, I prefer to skip the extra step and use raw broccoli. 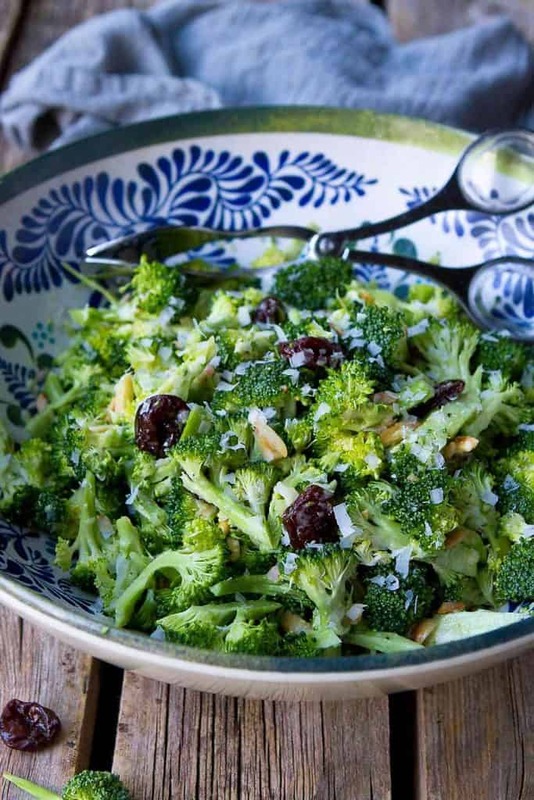 If the broccoli salad is allowed to rest for 20 to 30 minutes before serving and the broccoli is cut into small enough florets, it soaks up the vinaigrette, making it more tender and taking off that raw taste that some people don’t enjoy. Besides swapping vinaigrette for mayo, I subbed in Parmesan cheese for the traditional Cheddar cheese for a lighter cheese taste. 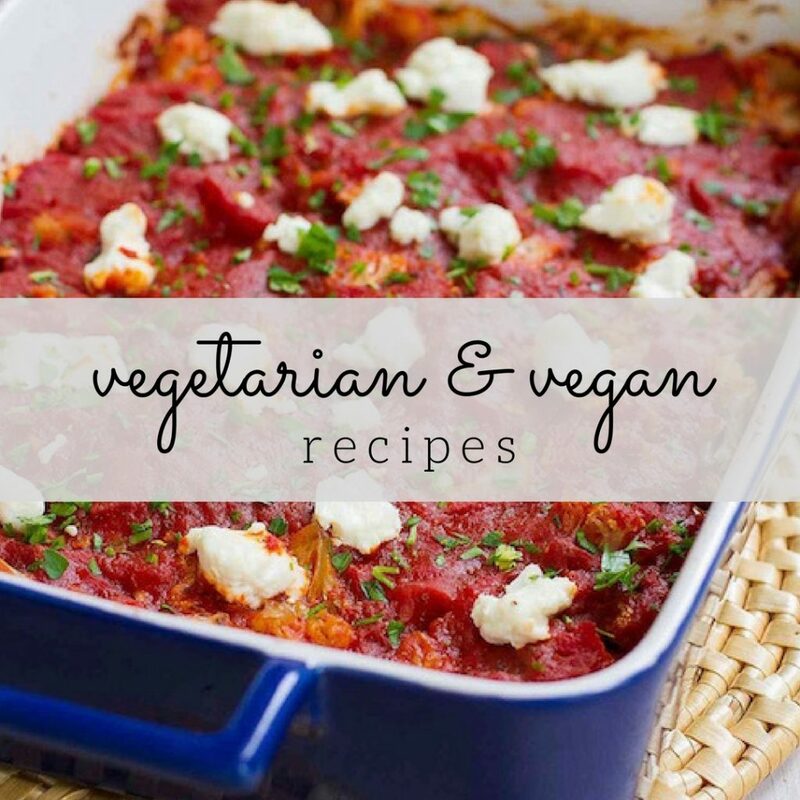 In addition, I left out the bacon and diced red onion. The bacon omission is to give those following a vegetarian diet the option of eating broccoli salad. As for the red onion – well, I just don’t like raw onion. I’ll pick it out every time! Two other small changes…I subbed toasted slivered almonds for sunflower seeds, through either would work well, and opted for dried tart cherries rather than dried cranberries because I prefer the flavor. Plus, I love how plump and juicy the cherries become as they soak up the dressing! 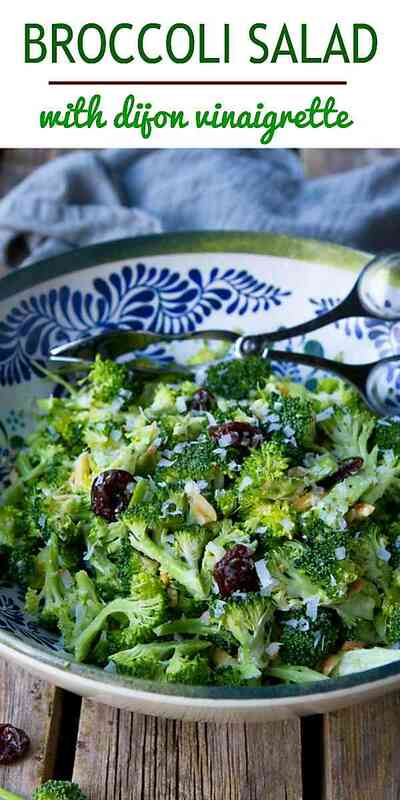 In a large bowl, combine the broccoli, tart cherries, Parmesan cheese and almonds. Pour in the dressing and toss to combine. 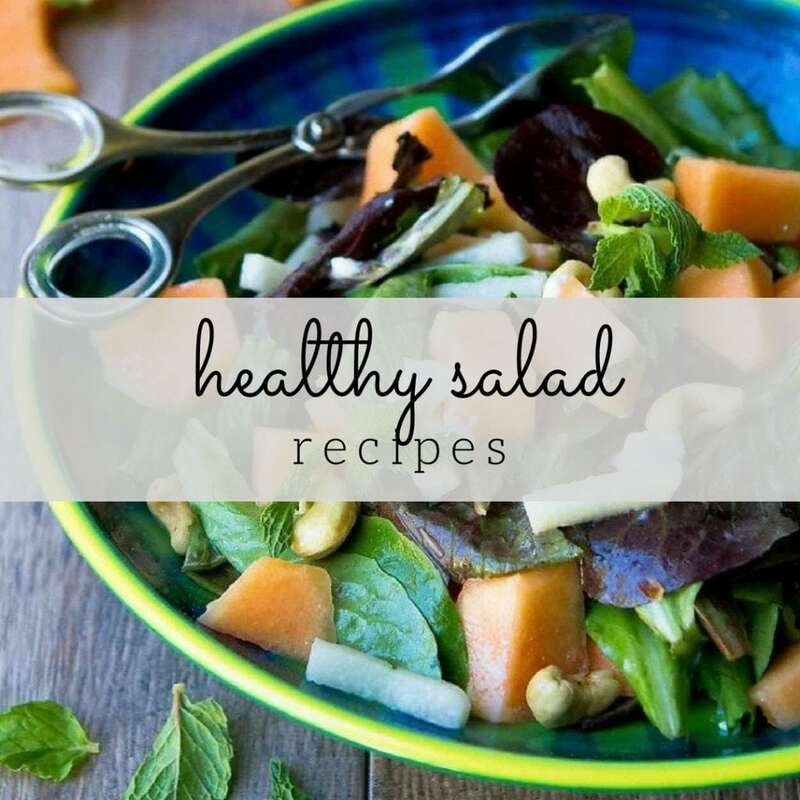 Allow the salad to rest for at least 30 minutes. Serve. In a medium bowl, whisk together the vinegar, shallots, Dijon mustard, agave nectar, salt and pepper. While whisking, slowly drizzle in the olive oil. Whisk until combined. I love the addition of the cherries! This looks interesting! Definitely going to try making this at home. Trying to find some more unique salads to try and I venture into the realm of eating healthier! Thank you so much for sharing. Love the addition of the dijon mustard too.